Cloud has reached tipping point in enterprise and the younger generation of employees are driving it. JP Rangaswami, chief scientist at Salesforce.com, talks to Jenny Williams about cloud computing's place within businesses. JP Rangaswami, formerly chief scientist at BT, joined enterprise cloud firm Salesforce.com as chief scientist in November. While Rangaswami will be working for Salesforce.com to develop product strategy and liaise with customers to gauge new service requirements, he wasn't always convinced about the cloud. "For many years I was unsure whether it [cloud computing] would mean anything for large enterprises. 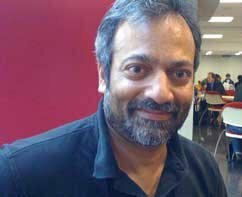 I was willing to buy the hype that it was only meaningful for SMEs," says Rangaswami in an interview with Computer Weekly at Salesforce.com's annual conference, Dreamforce, in San Francisco. Rangaswami, an internationally acclaimed thought leader in the technology industry, joined BT in 2006 as CIO for its global services arm. Previously, he worked for Dresdner Kleinwort, where he was CIO for several years. Rangaswami's foray into cloud computing at Salesforce.com coincides with a federal government announcement in the US that it is to increase its use of cloud-computing services and use Google's cloud-based application for its email messaging. And that's not simple, says Rangaswami. "The barriers have been that there are established ways of doing work, established vendors, established processes and established systems. Moving from them to the new world is not trivial," he says. "There was a lot of fear because people were using things like security to muddy the water," he adds. But Rangaswami says most people are using cloud-based services in their personal lives, so why not at work? Rangaswami believes the younger generation are the real driving force behind new developments in the enterprise market. "What we're seeing now is an emerging market and the tipping point of enterprise where the cloud is coming, fuelled by the new generation." But that isn't without its challenges. "The new generation still need a mundane understanding of services and infrastructure but they don't come with the same baggage as the previous generation." "It brings new challenges, we can't tell them to only use this locked-down computer in this place, in this form, because for them, the computer is a digital asset carrier." With this in mind, Rangaswami says cloud computing is what he wants to do as his last job before he retires. "The tide has turned [for cloud computing], it's no longer the future, it's today," adds Rangaswami. 1 Understand the cloud as a philosophy rather than just a technology. Be flexible in your approach to what are fixed costs, what are variable costs, what you can rent. 2 Businesses must prioritise where to make an investment. The cloud has switched from 'Why?' to 'Why not?'. 3 There's no better business strategy than hiring the best people. If you want to attract the best you have to set up a value system. 4 All these points can be summarised: watch your children. We're at an age where the best thing a senior exec can do is to watch his or her children because that's the essence of consumerisation and all these other things that follow as a result.